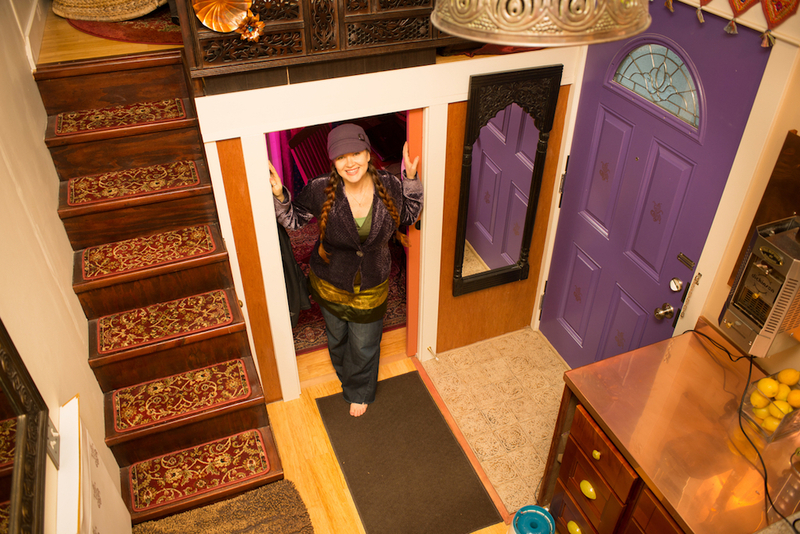 Anita’s 24’ tiny house on wheels named Lilypad is an eco-sanctuary with a bohemian soul. 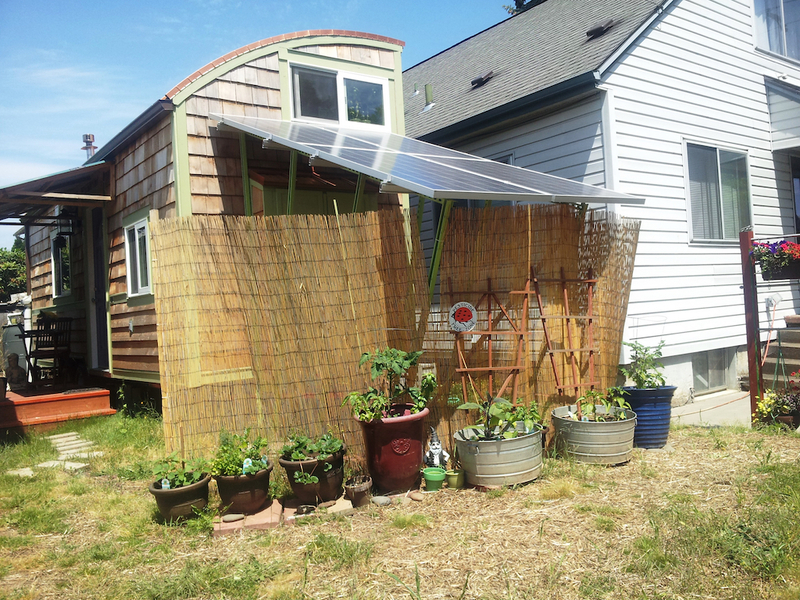 She hopes her wee home serves as both shelter – and – springboard to others endeavoring on a path to enhanced self-sufficiency and a gentler way of being. She’s dreaming of the ripple effect. Lilypad utilizes renewable energy resources and features a curved roof, two lofts, dual storage staircases and exposed beams. The home has five distinct areas including a galley kitchen, bathroom, bedroom, office and living room, these spaces are affectionately referred to as Savor, Soak, Slumber, Study and Sit. New windows on the back wall between the staircases installed in January 2016. 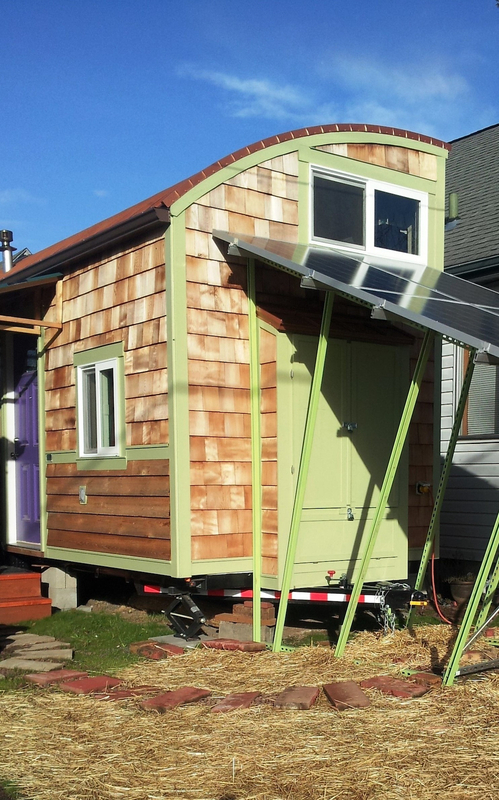 A tiny house on wheels built in 2014 and now in Portland, Oregon. Photos by Shawn Linehan, Walt Quade, Guillaume Dutilh. 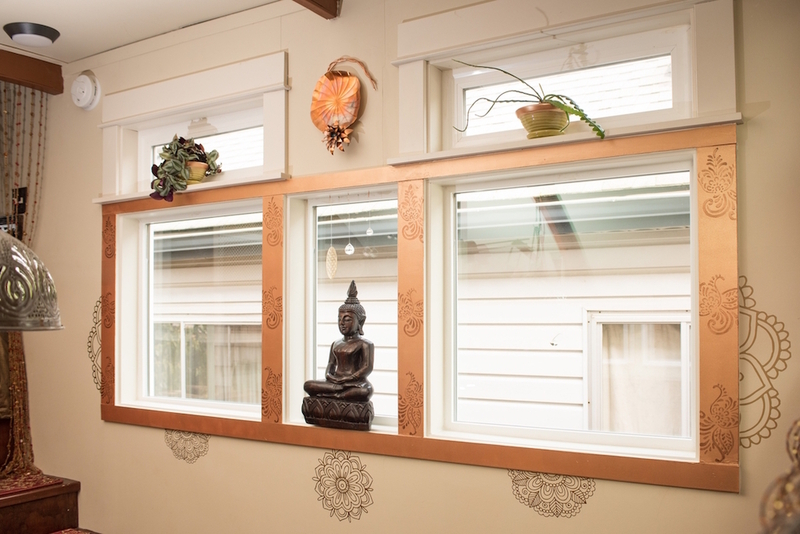 Interior tours and video at Lilypad Tiny House. This is a beautiful, comfortable, and inspiring home! That is a super cute Tiny House! This is delightful. Extremely unique and highly personalized. Love the full bath and the pull-out table, but most especially the little black kitty making himself comfortable on that sumptuous bed. Beautifully decorated, very personal, cozy spaces. Just what tiny living should feel like – abundant and full. I love the roofline. 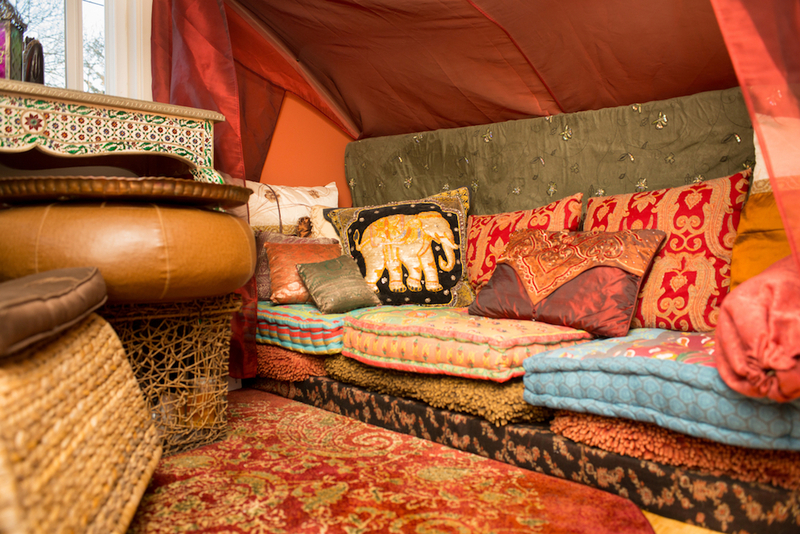 I’d love it even more if the outside had some more of the character of the inside – warm, inviting, and bohemian. Beautiful home. Hi Laura, thank you so much! My home was custom built by Walt Quade of Small Home Oregon. He is now available for consultations. We don’t have the “As Built” drawings or construction plans available yet, it was a unique design. Hi Grace, thank you so much! My home was custom built by Walt Quade of Small Home Oregon. He is now available for consultations. We don’t have the “As Built” drawings or construction plans available yet, it was a unique design. I love your TH! Very clever how you utilized the space. In most the TH I’ve seen, the extra loft is usually used for storage. Not at all pleasing to look at! You mentioned an oven. Is there any pictures that you could send me? This would have been a huge endeavor for my “Endymion” soul, around 20-30 years ago. I like the idea of the den/living room is in one of the lofts. 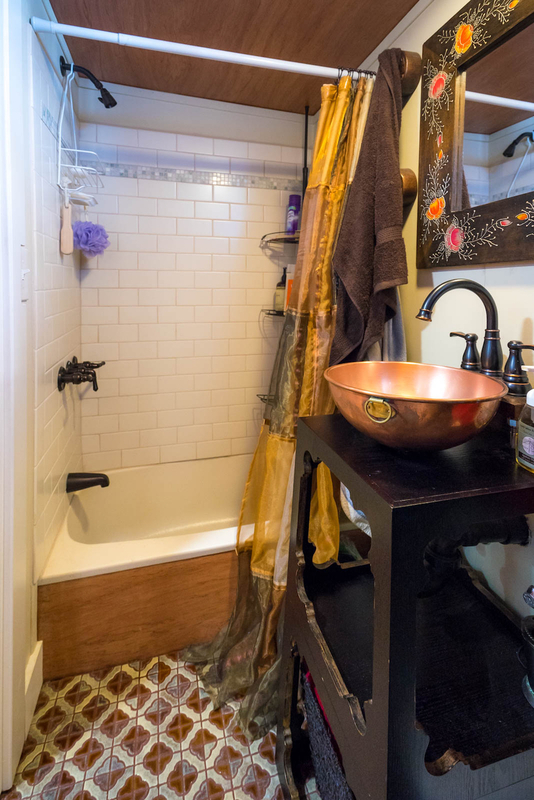 Thank you so much for sharing your comments about my home here on Swoon! If I weren’t 6 ft. tall this would be my favorite design. Still great. One of the best i’ve seen. My favourite design of ALL the tiny homes! This tiny home I could live in. Swap out her lovely style with my contemporary/traditional style with a touch of vintage. Yes, I can see myself opening up the door to this house after work. So many places to wind down. Unique and beautiful. I am a person who can’t take knick-knacks sitting around drawing dust, so my decorating taste would be very different, but I can see how beautifully done this little home is. This is one of the best tiny homes ever and has long been a favorite. I’ve never seen this many pictures of it–thanks! This is my absolute favourite tiny house that I’ve seen anywhere. Anita’s personality shines through in every aspect of the design and decoration. The utility of the five distinct spaces is amazing. Bravo! My favorite tiny ‘nest! Warm, inviting,great use of space and so interesting! Full of character and personality without being overwhelming! Very well done! I was blown away when I just saw your TH. It was laid out and designed as if I had. I have looked at over 10,000 TH’s and not one came close to the way this one struck me. From your roof angle and max water collection, denatured cook burners, to the interior colors, it was not only pleasing to the eye but very well thought out with efficiency and easy on the environment, playing a big factor. I also have 2 cats (and a dog). Where do you put the kitty box? This is one of my all-time favorites. Brilliant, beautiful use of space, and it looks so inviting and comfortable. Her height played a role in the amazing success of the office space area, but a taller person could scale everything down closer to floor level and learn to bend down before entering (just like the loft(s). The possibilities for this layout are endless. The upstairs living area is gorgeous.